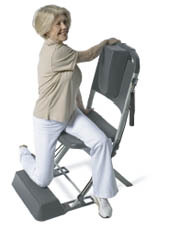 Take a few minutes to stretch your muscles and warm up before you start the strength training on the Resistance Chair. A good warmup will reduce the risk of injury and improves your blood circulation. 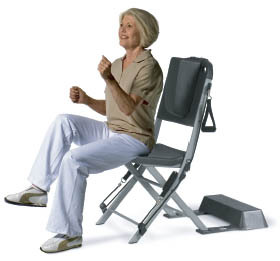 The warmup routines on this page are only a portion of what is available to you with the Resistance Chair System. Please consult with your medical practitioner before you begin a new exercise program. Sitting at the front edge of the chair, bend your elbows and march using both your arms and legs. When you raise your right leg, raise yoru left arm etc. Do 20 to 30 repetitions. Sitting up straight at the front edge of the seat pull one arm across your chest and perpendicular to the floor by using your other arm to gently pull. This will stretch the muscles on the back of your arm. Hold this stretch for 20 to 30 seconds then do the other arm. Sitting up straight at the front of your seat, slowly rotate your arms in small circles while your arms are straight out at your sides. Do at least 20 revolutions forward then backward. To add more of a challenge and providing a quicker warm-up try marching with your feet at the same time. Again sitting at the edge of the seat. While keeping your back straight, raise one arm out directly in front of you (Fig. A) and then straight up above your head as high as possible (Fig. B). Alternate arms and do 10 repetitions with each arm. Then raising both arms at the same time do this exercise again for 10 reps. Put your arms in front of you as if you’re pushing a door shut, and at the same time kick out one leg. Alternate legs while still pushing your arms with each leg kick. This makes for a great shoulder warmup and stretches the back of your legs. Do 10 to 15 repetitions with each leg. Back straight and seated at the front edge of the chair, extend one leg out straight – still resting your heal on the ground, then slowly raise your leg off the ground. Support your leg under your knee and point your toe at the same time. With your leg still raised, rotate your foot in each direction maintaining a circular motion. Do 5 to 10 repetitions with each foot. 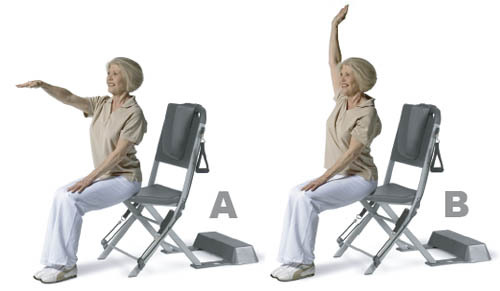 Cross your right leg over your left knee while seated at the front edge of your Resistance Chair. Keeping your back straight, slowly twist your body and look over your right shoulder. Hold for 10 seconds, then do the other side. 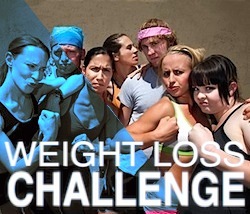 Don’t hold your breath during this exercise. Sitting straight but relaxes allow your arms to hang at your sides. Pull your shoulders up to your ears and then roll your shoulders back slowly. Do this 10 to 15 repetitions in each direction.